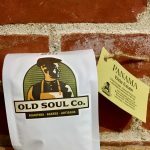 Panama Elida Estate Natural - Old Soul Co. - Old Soul Co.
Chocolate, tropical fruit, silky body. This is a natural processed coffee. The Lamastus family’s Elida Estate averages the highest growing elevations in Panama: 5,500 to 8,200 feet (1,700 to 2,500 meters). The Unicorn” is the real deal. This elusive, highly guarded and regarded coffee has found a great home in Sacramento’s meticulous Old Soul Co. roastery. 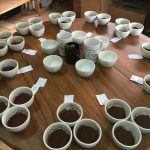 The award-winning Lamastus family has been growing and sourcing their Elida Estate coffee for four generations. The farm was started by Robert and Elida Lamastus in 1918. 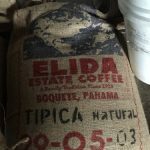 And that is why the name of the farm is Elida. All the five children were born at the farm and 83-year-old Thatcher still runs the operations of the farm, his son Wilford the quality and export, and his grandson public relations and social responsibilities. The farm has been growing coffee for 100 years non-stop making it a very sustainable activity. Around 60% of the farm is either private forest reserve or National Park. The total area of the farm is 160 acres. 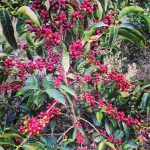 Around 100 acres are planted with coffee. The rest is native forest. The National Park where part of the farm is location (70 acres) is the Baru Volcano National Park (BVNP), a protected forest reserve and UNESCO world heritage. The BVNP has around 200 species of birds plus many species of butterflies and plants. 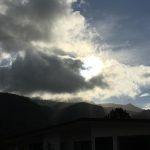 You can see the resplendent Quetzal flying above the coffee plantation. There is very limited use of fertilizer, very limited use of fungicide, and no pesticide. 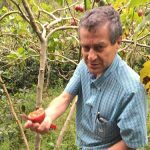 Being so high, the Elida farm does not get the Roya (rust), nor Broca (beetle borer); therefore, there is no need to control these two pests.